You ask, Bagaholicboy answers. The men got their share of classic bifold options (with a twist, of course), but what about the ladies? 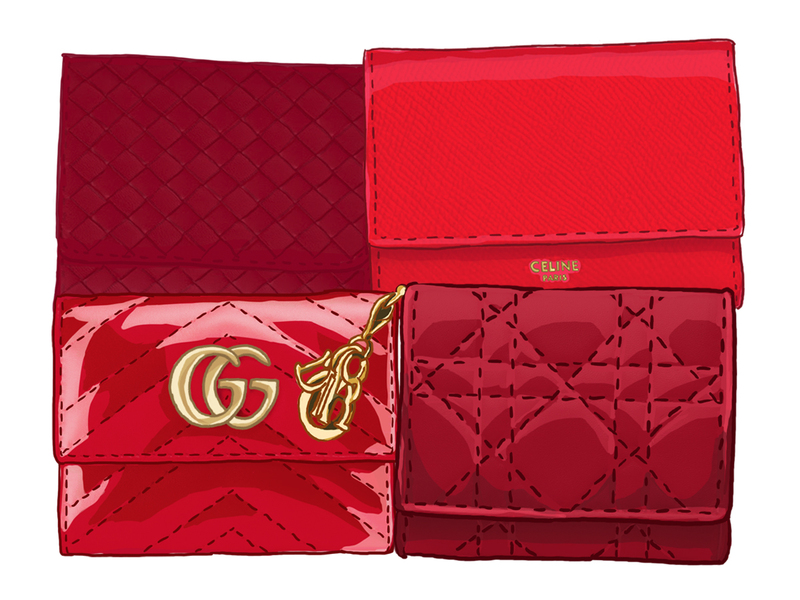 Specifically those looking for a compact wallet that will match their bold and bright red lipstick to a T. Now, before delving into the 8 wallets proper, what exactly is the right classification and definition of a compact wallet? For one, the size. Compact wallets, as the name suggests, is smaller (in terms of width) than a long wallet and pretty much perfect if you don’t need to carry all 12 credits cards around with you all day long. Two, compact wallets typically come in a trifold format, with an extra pocket or compartment for coins, as well as a longer slot that fits cash and receipts. Which you will definitely find across all 8 wallets featured here. Contrary to its name, the wallet is actually a compact piece (the term ‘continental’ is typically used to described long wallets), one that measures just 11 cm across. Coming in the Italian luxury house’s signature Intrecciato nappa leather exterior, the wallet is fitted with 6 card slots, 4 slots for bills and receipts, as well as a separate zipped coin compartment. Celine’s version is as classic as it gets, one that lets the grained calfskin shine on its own (save for that tiny CELINE PARIS logo at the bottom). Unsnap the flap closure and you’ll find 5 credit card slots, a note pocket, as well as a flat pocket that will fit your coins. The Lady Dior line is characterised by the iconic Cannage topstitching and D-I-O-R hang charms, all of which have been translated beautifully into a compact wallet. This particular piece is armed with 4 card slots, 2 flat pockets (for folded receipts and such), as well as a billfold compartment to slot your notes. The press stud pocket? That’s for coins, keys and other nifty bits. Clare Waight Keller has been reviving the 4G logo into the leather goods lineup, which also happens to be the central focus of this wallet. The powder pink interior provides a nice contrast against the poppy red exterior, and comes fully furnished with all the essential compartments like 3 flat pockets, 1 bill compartment and 4 card slots. Looking for the pocket that will fit your coins? Flip the wallet to the back and you will find a zippered one. Gucci’s widely popular line, GG Marmont banks on a number of success factors like that matelassé chevron leather and gold-toned GG hardware logo stamped in front. The entire family consists of everything from bags for him and for her, to accessories, shoes, and of course SLGs such as this compact wallet above. It’s a truly functional piece, one that opens to 6 card slots, 3 open pockets, a long compartment for cash and a zip pocket for coins and keys. From one matalassé wallet to the next, Louis Vuitton’s rendition comes with a cool wave pattern drawn from its historic trunks. Over on the inside, the wallet is fully lined in calf leather, coming with 6 credit card slots, 2 flat pockets and a single bill pocket. The zip pocket right by the side is armed with the rainbow LV Initials pull tab that makes for a rather unique touch. 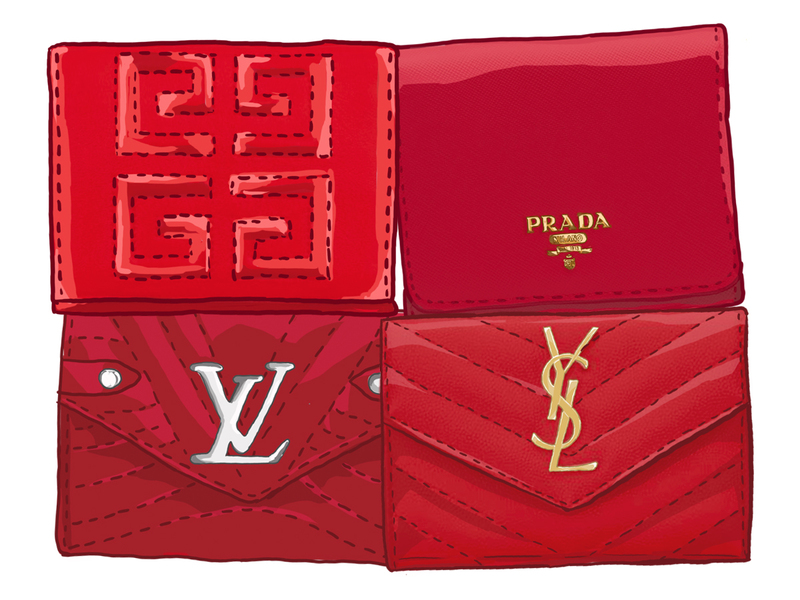 Prada’s Singapore boutiques are currently streamlining their small wallets range to a bifold size that isn’t exactly a compact wallet simply because it does not have an extra compartment for coins. However, there’s one particular piece available online at Farfetch that comes with six card slots, a billfold compartment and a flap coin pocket all housed within a fire engine red Saffiano leather body. Now, if the two matalassé pieces aren’t to your liking, you can consider this piece from Saint Laurent, one that comes with the signature interlocking YSL signature hardware right in front. Aside from the wallet coming with several essential elements like 6 card slots, 1 zip pocket (for coins or keys), 1 bill compartment and 4 receipt slots, the other great thing would be the Grain de Poudre embossed leather, hardy enough to withstand everyday wear and tear.